July is the month for Union Pacific enthusiasts. First, AZL has released UP tri-level autoracks. They appear in the ‘Building American’ livery. Two runner packs and two singles have been released. The first set is item 91001-1. The road numbers are: 701267, 701494, 701581, 701628. The second set is item 91001-2. The road numbers are: 902209, 902439, 903403, 903816. The MSRP is $131.00. The first single car is item 91951-1. The road number is 907756. The second single is item 91951-2. The road number is 907841. The MSRP is $38.00. The next UP release is 60’ beer cars. A runner pack and a single have been released. The runner pack is item 90267-1. The road numbers are: 465350, 465393, 465324, 465316. The MSRP is $120.00. The single car is item 91267-1. The road number is 465327. The MSRP is $34.00. The third UP release is waffle side gondolas. A runner pack and a single are available. The runner pack is item 90243-1. The road numbers are: 32712, 32717, 32729, 32734. The MSRP is $117.00. The single car is item 91243-1. The road number is 327359. The MSRP is $32.00. 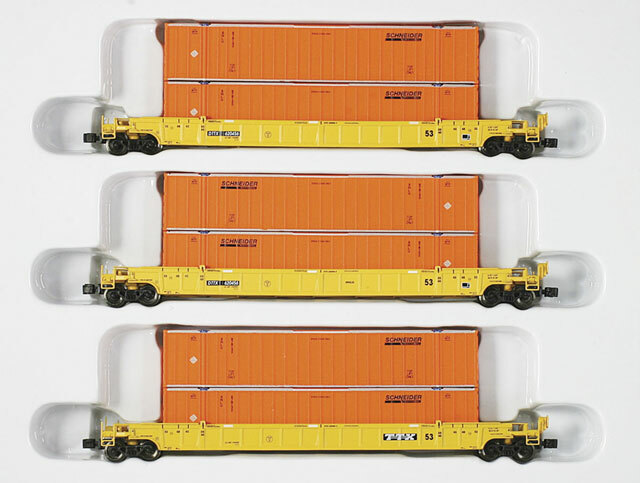 A new set of DTTX 53’ well cars have been released. The runner pack is item #90601-6. It comes with six 53’ containers lettered for Schneider. The road numbers on the cars are: 620456A-620456B-620456C. The MSRP is: $133.00. NOTE: The Ztrack offices will be closed from Friday June 28th through Sunday July 8th, 2012. Any orders received during this period will be shipped once we return.